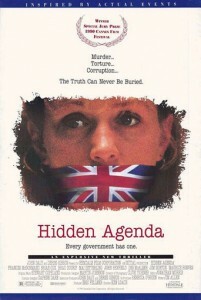 Plot: When an american human rights lawyer is murdered in Belfast, it remains for the man’s girlfriend and a though police detective to find the truth… which they soon discover to be contained in an audio tape which the lawyer had with him, exposing political manipulations at the highest levels of government. But such underlying agendas require careful considerations to avoid worse things than murder. This entry was posted in H. Bookmark the permalink.